The Office of the Chancellor provides personnel support for the priests and deacons of the Diocese, including retirement and clearance for ministry outside of our diocese. The Office of Vocations promotes priestly vocations, selects qualified candidates for discernment, coordinates the formation and education of seminarians, provides for current seminarians, and presents qualified seminarians for priestly ordination. The Office of Catholic Schools ensures the spiritual and professional development of administrators and teachers, providing our 19 elementary and 6 high schools with quality application of curriculums. The Office of Catechesis and Family Life guides and develops effective Catechetical leadership in the parishes of the Diocese by providing training and resources, including Catechist Certification Levels I and II. The Office of Hispanic Ministry reaches out in a spirit of welcome and inclusion to the Hispanic families in our diocese to provide, especially in Spanish, resources and programs of ministry formation and training. The Common Formation Office provides pastoral services to all parishes and missions of the Diocese. The Parish Services team offers expertise in religious education, family life, liturgy, ministry formation, spirituality, parish planning, and much more. The Office of Human Life and Dignity initiates and supports programs that promote respect for the dignity of human life and the Social Mission of the Church through education and advocacy reflecting Catholic Social Teaching. The Office of Child, Adolescent, and Adult Protection ensures the safety of children, young people and vulnerable who have been entrusted to our care in our schools and other programs. They thoroughly screen school employees and volunteers who work with children, young people and the vulnerable as part of their ministry, holding them to Christ-centered and professional codes of conduct. They provide appropriate training in recognizing and reporting child/adult abuse to appropriate civil and Church authorities. The Office of Property and Insurance Services provides administrative resources and insurance compliance for school facilities. 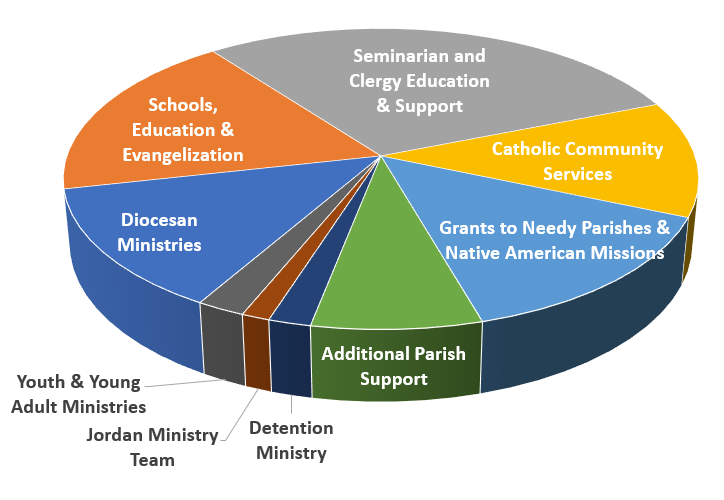 Grants to Needy Parishes & Catholic Affiliates are awarded by the Catholic Foundation board of directors through a process of needs assessment review of grant applications. Native American Missions receive grant funding in time of financial difficulties. The Office of the Bishop supports the pastoral and administrative ministries of the Bishop, allowing the Bishop to fulfill his pastoral and canonical responsibilities. The Office of the Moderator of the Curia oversees the most efficient use of staff, facilities, equipment, and administrative systems and resources of the Diocese, ensuring that the personnel of the Curia properly fulfill the offices and responsibilities entrusted to them. The Office of Religious Women is the liaison to the Bishop for the Women Religious of the Diocese of Tucson. The Office of Archives, through the collection, organization, and preservation of the official records of the Diocese, provides an accurate historical record of the Catholic church in Southern Arizona. It supports parishes, faith communities, and schools in their efforts to establish and maintain current and historical records. The Office of the Permanent Diaconate provides for invitation, pastoral support, formation, continuing education, and evaluation of permanent deacons. Pastoral Care Ministry Program brings the presence of Christ and provides comfort & consolation to the elderly and gravely ill through masses, communion services and personal visits to residents in nursing homes, hospices, and assisted-living centers. Catholic Community Services of Southern Arizona (CCS) serves as the human services arm of the Diocese of Tucson. Its mission is to strengthen children, adults, families, and communities by providing help, creating hope and serving all. CCS works through a family of agencies and ministries in Tucson, Sierra Vista, and Yuma. CCS also oversees the Pio Decimo Center, Deaf & Residential Services, Aid for Migrant Women and Children, the Kolbe Society (Detention Ministry), and the St. Jeanne Jugan Ministry with Elders. The Office of the Tribunal represents the judicial ministry of the Church. By means of the Church’s legal processes as determined in the Code of Canon Law, an individual can present a case to the Tribunal in order to resolve his/her marital status. For a person whose marriage has ended in divorce, the Tribunal provides the opportunity to have the marriage reviewed to see if it is valid or invalid according to the norms and teachings of the Church. The Tribunal cooperates with pastors and with other offices and agencies in fostering pastoral care to persons who are separated, divorced, and those planning a future marriage with the Church. Following the wishes Pope Francis expressed in his apostolic letter of September 8, 2015, Mitis Iudex Dominus Jesus, the Tribunal office no longer charges a fee for services. The Office of Child, Adolescent, and Adult Protection ensures the safety of children, young people and vulnerable who have been entrusted to our care in our schools and other programs. They thoroughly screen members of the clergy, as well as parish employees and volunteers who work with children, young people and the vulnerable as part of their ministry, holding them to Christ-centered and profession codes of conduct. They provide appropriate training in recognizing and reporting child/adult abuse to appropriate civil and Church authorities. The Office of Property and Insurance Services provides administrative resources and insurance compliance for parish facilities. The youth and young adult ministries within the Diocese of Tucson empower young people to live as disciples of Jesus Christ and help draw them to responsible participation in the life, mission, and work of the Catholic faith community. These ministries work to connect young people to Jesus Christ, the Church and her mission through spiritual formation, religious education and direction, and vocational discernment; evangelizing outreach, formation of the faith community, and pastoral care. The Jordan Ministry Team includes trained formators, catechists, and spiritual directors – in collaboration with the Roman Catholic Diocese of Tucson – who are dedicated to forming Catholic leaders and all members of the Church according to the Second Vatican Council’s universal call to holiness and Church’s commitment to the New Evangelization. Their programs include ministry and leadership development, faith formation, and spiritual enrichment. Funds from the Annual Catholic Appeal ARE NOT USED to offset capital expenses, uncollectible accounts receivable, depreciation, repayment of loans, or legal services.